Our featured homes, Harbor Moon, Groth House and Harbor House, all overlook Trinidad Bay, some of the most spectacular Pacific Ocean vistas seen in California. Snug Harbor, located in South Trinidad, overlooks Clam Beach with gorgeous ocean views. These exquisite homes have distinct and alluring features that will suit even the most distinguishing preferences for a Northern California coastal escape. A full host of luxurious amenities, on-call management, and prime access to services in Trinidad are some of the reasons that these are three of the finest vacation rentals offered in this quaint coastal village. Harbor Moon will take your breath away the moment you arrive. Its optimal location, coupled with opulent, nautical-inspired interior features will surely satisfy the most discerning vacationer. Suited for active families or for groups or couples just looking to relax and unwind, Harbor Moon will fulfill your needs. The furnishings, design features, appliances, and fully-equipped outdoor kitchen set the precedent for ensuring ultimate contentment. Expansive spaces, top-quality amenities, ample natural light, and lavish comfort will hold you captive as you relish in the surrounding coastal scenery. Far-reaching sea views to stir your imagination and dreams, as well as proximity to the quaint hamlet of Trinidad, its restaurants, Trinidad Head, and pristine beaches add significant appeal to this consummate home. Make Harbor Moon your destination for luxurious accommodations, grand spaces, prime location, stunning views, ocean-side entertaining for a large group or a romantic retreat. Groth House will leave you awe-struck and inspired by its world-class, architectural elements set in a paradise location. The home is perched in of the most picturesque settings in all of California, offering the best views of the Trinidad Bay. 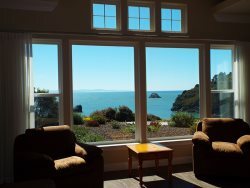 Located very close to a pristine beach, this home affords views of dramatic sea stacks towering above the turbulent seas, flocks of marine birds soaring and diving, turquoise and emerald hues of the bay glowing against the darkened rocks, and fishermen bustling across the bay on the pier, all framed by the looming Trinidad Head. The famous home, built by artist Bruno Groth, features custom-crafted, rich woodwork; a wall of artistically-shaped, enormous view windows; newly furnished and remodeled interior spaces; wrap-around deck; and luxuriously-appointed living and sleeping arrangements. The 3-bedroom, 3-bath home accommodates 6 guests. Groth House lures your soul to fully retreat here. Harbor House sits nestled above the incredible Trinidad Harbor. 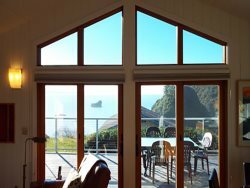 The beautiful Anderson windows in the living room exposes the gorgeous bay views. The deck has also been recently expanded, giving you the space needed to breath in the crisp ocean air, all while taking in the rocky sea stacks that surround Trinidad's fishing fleet. As you recline on the quality leather couches, you'll notice the hard wood floors and a gas fireplace giving you the feel of excellence and relaxation. Your decision to choose Harbor House as your vacation destination will leave you with a sense of satisfaction. This intimate home is suitably priced for couples. Rent the upstairs only or add the downstairs for parties up to four. It's optimal location allows for easy walking between Trinidad State beach, Pier, and town. Enjoy the simply pleasures of Trinidad's treasures. Book Harbor House today! Bring the whole family to stay at Snug Harbor. With four bedrooms and three bathrooms there's plenty of room for everyone. Sit back and relax in the master bedroom enjoy a claw foot bathtub with Ocean views. The queen room, located upstairs, is complete with ocean views as well. The third bedroom also located upstairs has two double beds perfect for kids. Downstairs holds the fourth bedroom with a futon bed. Around the corner, you enter the charming kitchen, fully stocked and complete with ocean views. Enjoy gathering with loved ones to make your favorite meal. Sit for a nice glass of wine or tea over the dinner table or retreat to the living room over a warm fire. This home sits on nearly an acre of land giving the kids and pet room to roam. Soak in your private hot tub surround by lovely gardens displaying color and beauty. This home is pet friendly and includes free Wi-Fi. We invite you to make your way to Trinidad-by-the-Sea, a unique coastal village that draws visitors from all over the world. 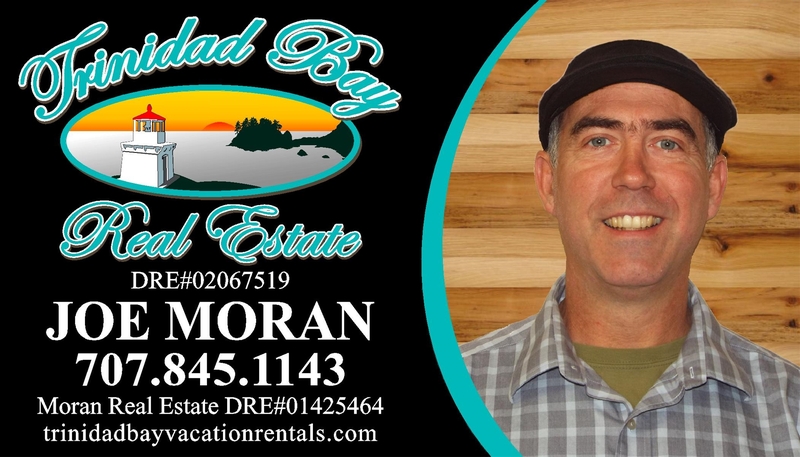 Whether it is for world class fishing, ocean recreation, views, parks, redwoods or to enjoy its quiet North Coast charm, the rich and diverse history and cultural significance of the Trinidad Harbor creates a character all its own. Trinidad Harbor encompasses an ancient Yurok village of "Tsurai", the earliest known inhabitants of Trinidad. It's fleet of commercial and sport fishing boats are nestled behind Trinidad Head, California's last natural harbor in commercial use. The fishing out of Trinidad Harbor plays a critical role to both local tourism and the greater Humboldt County commercial fishing industry. The history of this coastal town goes back many, many years and can be better understood by visiting the Trinidad Museum. 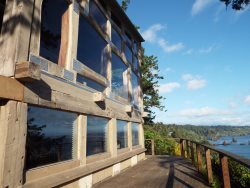 Surrounded by lush, alder and redwood-forested bluffs and hills, our coastline, bay, beaches and trails will leave you spellbound with the scenes that unfold around each bend. This is a singular town, among the smallest of California's municipalities. Gateway town to Redwood National Parks, the California Coastal National Monument, Humboldt Lagoons State Parks to the north, as well as myriad recreational opportunities all over our adventure-filled part of the state, Trinidad should definitely be on your bucket list of places to visit! Three marine landmarks, the historic Trinidad Head Light, the Trinidad Memorial Lighthouse, and Humboldt State University's Fred Telonicher Marine Laboratory, are found here. Trinidad is off the beaten path and has something for everyone. 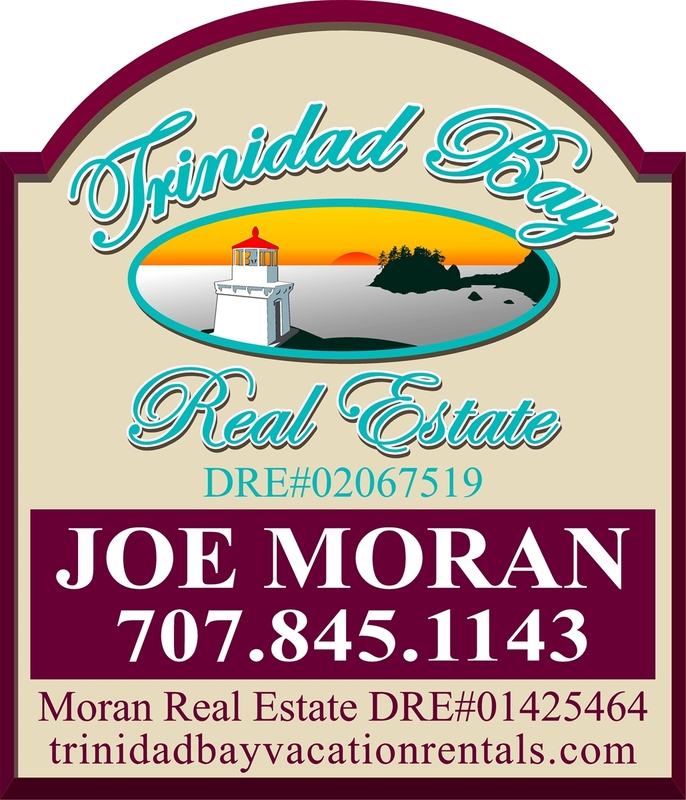 Trinidad's homes are some of the finest in the region, as the ocean views incomparable. There is no wonder why many people choose to have their vacation home here. We want to share their wonderful homes with you. We focus on providing guests with an exceptional vacation experience. Book online or give us a call. We will extend our professional yet personal approach to serving you. Whether you come for the forests, the fresh air, to hear the sounds of the ocean or for the world class beaches, Trinidad Bay is a fantastic north coast getaway.